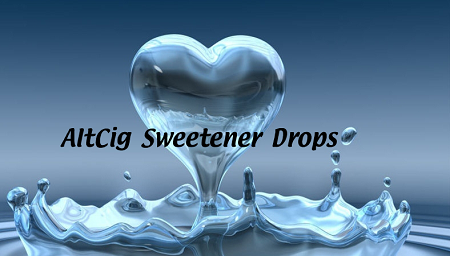 Sweeten your e-juices with our no calorie sweetener drops. One drop is equivalent to the sweetness of one teaspoon of sugar. For best results test one drop at a time. Use sparingly to sweeten eJuice. Doe not contain nicotine. Diabetic friendly. Aspartame free. This am so glad I found this! I use it in a lot of my fruit flavors. These are awesome. I have just started using them, and they really give quite a sweet kick with just one drop! If I had had these before I discovered AC, I might have really enjoyed some of those mediocre juices. Good stuff, with a ton of uses! This is just perfect when you need a little or a lot of extra sweet'..to your vape..oh my..it has a fantastic flavor. Love to add this to fruits especially...* I give it a big thumbs up! Thanks altcig ! Lee M.
I have half a 6ml tank of 'pudding cake' and the other half 'banana milkshake' and one drop of this 'sweetener enhancer', and this is THE BEST juice i have had in my entire year or more of vaping. bar none. Got a sample of this from my fav vape lady Boodle and I have to say I love it! I added 4 drops to the tangerine and it really made the flavor pop, with no funky aftertaste. Be careful with it and start slow, 4 drops to 15 ml was plenty for me. Ymmv. I will def be keeping this one in my vape arsenal!